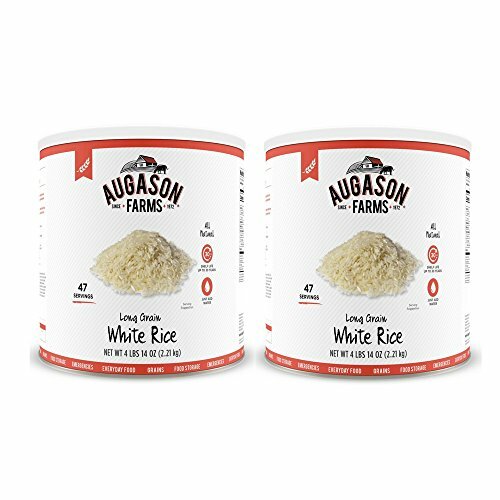 Augason Farms Long Grain White Rice 4 lbs 14 oz No. 10 Can (2 cans) by Augason Farms at Smokey Robinson Foods. Hurry! Limited time offer. Offer valid only while supplies last. The Augason Farms Long Grain White Rice 4 lbs 14 oz No. 10 Can is the perfect fluffy white rice to enjoy by itself or added to casseroles or soups. The Augason Farms Long Grain White Rice 4 lbs 14 oz No. 10 Can is the perfect fluffy white rice to enjoy by itself or added to casseroles or soups. It's long storage life makes it the perfect food item to keep in your food storage supply. This is a Certified Gluten Free and product that consists of 47 Servings and 7,990 Calories, with a shelf life of up to 30 years. All this convenience makes it perfect for Food Storage, Emergencies, Survival, Camping, and Everyday Use! Make the wise decision and let Augason Farms give you a peace of mind that's as indispensable as it is delicious. Family owned and operated since 1972, Augason Farms believes that great taste is a tradition worth preserving. They'll provide you with delicious peace of mind with their food essentials. Please discard oxygen absorber after opening. Best when stored in a cool dry place at temperatures between 55 and 70 F (ideal humidity 15%). Texas Best Organics Long Grain White Rice, 32 Ounce - 6 per case.